Tonight’s foreign policy presidential debate will feature plenty of talk about Libya, China, the Middle East, and terrorism but if it’s anything like every other political event ever anywhere, it will also feature plenty of exaggerations, mistruths and outright lies. Starting tonight at 9 p.m. Eastern, we’ll be calling them out in real time and bringing you the, you know, facts -- so refresh this page often to stay up-to-date. Tweet at @aseitzwald if you see something you want checked. Also be sure to check out Alex Pareene’s liveblog. 11:00: Romney's afghanistan policy -- Romney tonight clarified his Afghanistan policy tonight, saying he wants to pull troops out of the country in 2014 and hand over full security control fo the Afghans. That means he has the same Afghanistan policy as Obama's. 10:35: Auto bailout -- In one of the most heated moments of the debate, though it had nothing to do with foreign policy, Romney and Obama traded barbs over the auto bailout. Obama said Romney would have let Detroit fail, Romney said that that wasn't true. Both men supported putting the auto companies through a managed bankruptcy to help restructure them, but the key question comes down to whether or not to use government loans to help save the companies. Obama supported using government funds, Romney did not, though Romney did say "the federal government should provide guarantees for post-bankruptcy financing and assure car buyers that their warranties are not at risk," as he wrote in the infamous New York Times op-ed titled "Let Detroit go bankrupt." This allowed Romney to have it both ways. For years, he railed against the bailout as wasteful and dangerous government intervention in private industry. But as it became clear that the bailout was succeeding, Romney softened his tone and claimed the Obama administration followed his plan. The problem for Romney, however, is that guarantees would have not have been enough to save the industry as there was no private funding available. In the end, both candidates some finger wagging: Obama ignored the fact that Romney wanted to include federal guarantees and Romney is pretending that the guarantees were the same as loans and that he supported the same policy as long. 10:10: Heaven and earth -- Obama attacks Romney on Bin Laden, saying, "You said we shouldn't 'move heaven and earth to get one man.'" That's true, but he glossed over the fact that Romney said he would take a more holistic approach to fighting Al Qaeda than going after Bin Laden alone. 9:55: Apology tour? Romney said Obama "went on what I would call an apology tour." It's one of the oldest and most thoroughly debunked myths of the Obama era. 9:45: Smallest Navy since World War I? Romney said Obama would reduce the Navy to its smallest size since World War I. Politifact gave that claim a Pants on Fire and called it ridiculous. 9:40: The 1980s are calling -- Obama delivered what will likely be one of the most memorable lines of the night when he told Romney, “The 1980s are calling to ask for their foreign policy back.” He was attacking Romney for being bellicose with Russia, quoting Romney as saying Russia is our “Number one geopolitical foe." Romney countered by saying that Obama was taking Romney’s claim out of context. Who’s right? Romney did in fact call Russia, “without question our number one geopolitical foe” in a CNN interview. But Romney was making a more nuanced point that Obama lets on. Romney continued in the very next sentence, “Of course the greatest threat the world faces is a nuclear armed Iran.” So Romney was trying to say there are different threats facing America, and Russia is biggest threat of a certain kind. His statement was inartfully worded, but Romney is right: Obama is taking his quote out of context. 9:30: Route to the sea? 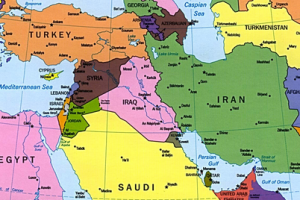 Romney comments that Syria "is Iran's route to the sea." It's unclear if Romney hasn't looked at a map lately or left out the word "Mediterranean," because Iran has its own sea access and shares no border with Sryia. In order to get to Sryia, Iran would have to go through Iraq, which hasn't been a huge fan of Iran over the years. "In Iraq, the costly gains made by our troops are being eroded by rising violence, a resurgent Al-Qaeda, the weakening of democracy in Baghdad, and the rising influence of Iran. And yet, America’s ability to influence events for the better in Iraq has been undermined by the abrupt withdrawal of our entire troop presence." Looking at the text, it's clear that Romney attacked the president for withdrawing troops too quickly, but he was not specific on whether he wanted to leave troops there. So Obama is overstating the case a bit while Romney is trying to have it both ways.